On Saturday, March 23, the Nashville Symphony gave a performance entitled Spanish Nights, featuring guest conductor Miguel Harth-Bedoya. 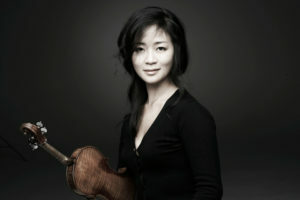 The concert was comprised of four pieces from composers of varied nationalities, but a common Spanish influence, opening with Capriccio espagnol by Nikolai Rimsky-Korsakov, followed by Édouard Lalo’s Symphonie espagnole for Violin and Orchestra, featuring internationally-renowned violinist Chee-Yun. Following intermission, the evening concluded with Joaquín Turina’s Danzas fantásticas, and Manuel de Falla’s Suite from El sombrero de tres picos (The Three-Cornered Hat). 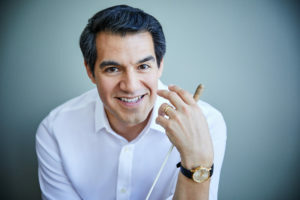 Guest conductor Miguel Harth-Bedoya boasts an impressive international career, and is currently the music director of the Fort Worth Symphony. Harth-Bedoya is also the director and founder of Caminos Del Inka, a nonprofit organization dedicated to the research, discovery, and preservation of South American music. I cannot think of a better conductor for a program of Spanish and Spanish-influenced music. Nikolai Rimsky-Korsakov completed and premiered Capriccio espagnol in 1887, and it immediately gained favor by audiences and performers alike. Rimsky-Korsakov was inspired to write the piece by some of Glinka’s Spanish-inspired works, and also draws from his time in northwestern Spain while he served in the Russian navy. This piece was originally intended to be a violin concerto, but other solo instruments were incorporated and heavily featured in the composition. The piece began with enthusiasm, and captured the attention of the audience from the first note. Flawless clarinet solos conversationally wove in and out of the orchestral texture, and possessed the perfect tone, character, and energy of the piece. (He even gave a well-deserved wave of his red cleaning cloth at the end of the piece, which got a nice laugh from the audience!) Each movement flowed seamlessly into the next, and conveyed every emotion and evoked every image that Rimsky-Korsakov intended. Every cadenza and solo passage from the violinist, flutist, and harpist sounded absolutely effortless and showcased the virtuosity of the performers perfectly. It truly was one of the best performances of the piece that I have ever had the pleasure of hearing, and was the perfect way to kick off the evening. Édouard Lalo composed his Symphonie espagnole after premiering his successful Violin Concerto, and premiered it just one short year later. This piece could easily be considered a violin concerto as well, but Lalo wanted to maintain the image of the violin soloist “soaring above the orchestra” instead. Chee-Yun, the violin soloist of the evening, is a world-class performer and educator, and has performed on five continents and held faculty positions at many well-known universities. Interestingly, she also performs on a violin that was made in 1669! notably, the fourth movement was filled with so much emotion and lyricism, and showcased the vast stylistic range of the Nashville Symphony. In comparison to the Rimsky-Korsakov, it was a bit of gentle slide into intermission, but it was pleasant and enjoyable nonetheless. Joaquín Turina composed Danzas fantásticas in 1919 and premiered the piece a year later in Madrid. Turina composed the piece once he returned to his home in Spain after spending time during World War I in Paris. It’s no surprise that Danzas fantásticas became his most beloved composition, as it showcases three different, yet equally exciting Spanish dances: the jota, a Basque-inspired dance, and finally a dance in the flamenco style. No time was wasted after intermission, and the audience was brought right back in with Turina’s exciting Danzas fantásticas. While they did not begin bombastically, they started with a captivating, quiet excitement that steadily grew throughout the piece and kept the audience on the edge of their seats the entire time. The transitions between each dance were clear, but seamless and well executed, and all of the woodwind and brass features were truly extraordinary. It was also very refreshing to hear a selection by a Spanish composer, and it seemed to recapture the attention of anyone in the audience who may have wandered off a little during intermission. Manuel de Falla composed El sombrero de tres picos (The Three-Cornered Hat) between 1916 and 1918, and premiered the full ballet in 1919. De Falla, like Turina, spent time in Paris, and was influenced by Ravel and Debussy. This work also came out of de Falla’s time in Paris and relationship with Serge Diaghilev, and was based on a novella by Pedro Antonio de Alarcon. Its story follows a miller, his wife, and their attempts to bring down the town magistrate after he attempts to seduce the miller’s wife. These three characters are represented by different instruments and themes throughout the orchestra, and in this suite, their stories are told through a series of Spanish dances, such as the jota, the fandango, and the farruca. The suite began with an exciting trumpet and timpani duet, keeping the energy of the concert and starting the final piece of the concert strongly. In fact, the large number of brass features in the piece was a wonderful change of pace, and surely excited the low brass to have a great deal of moving parts! All of the woodwind features in the piece, particularly the English horn, were flawless as always, and really added character to the performance. Once again, the seamless transitions between movements and even suites was wonderful, and it breathed a certain life into the story of the piece. The concert concluded with a rather fast-paced but well done jota, and once again was very well-received by the audience. All in all, it was a fantastic concert filled to the brim with energy. The masterful conducting and interpretation of Miguel Harth-Bedoya was matched by the playing of the Nashville Symphony and guest artists Chee-Yun. As always, it was pleasure to witness these musicians performing together.